Frederick Ross began his career as a medical student, but he was lured by the stage and made his first professional appearance in 1898. 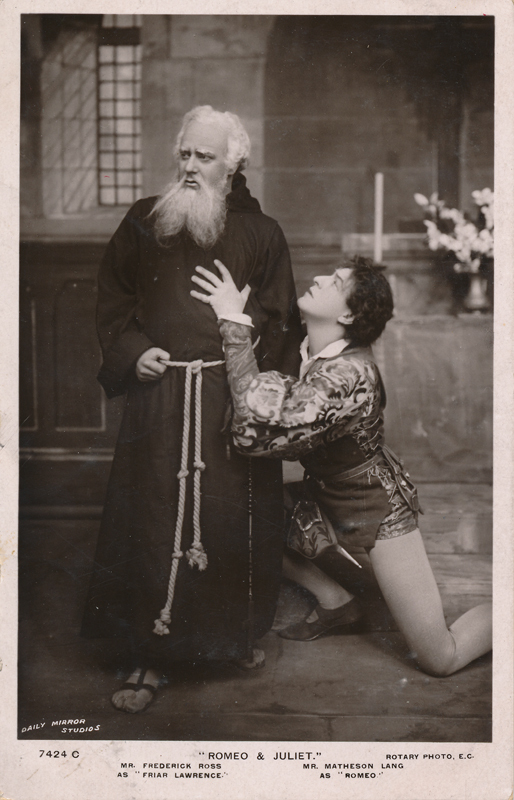 His first part in Shakespeare came in 1907 when he played Friar Laurence in Matheson Lang‘s production of Romeo & Juliet. The next year he played the ghost in Hamlet, and in 1909 Lord Hastings in Richard III. Five years later in 1914 he played Sir Richard Vernon in Henry IV at His Majesty’s Theatre. After a brief tour of America, he returned to London in 1916 and again played the ghost in Hamlet; in 1919 he played Claudius in the same play. When asked what his favorite parts were, he answered the ghost and Friar Laurence.